These structures are easier to take down than it seems. Fortnite: Battle Royale players who want to complete all the recently introduced Ice Storm challenges will have to destroy Ice Shards. Doing so is not that difficult, but understanding exactly what an Ice Shard is and what the best ways of destroying them are, is what might be a pain to complete the challenge quickly. What is an Ice Shard? Ice Shards are the big ice structures from which the zombie-like creatures from the Ice Legion spawn in Ice Storm game modes. They won’t appear in modes that aren’t part of the event, such as Limited Time Modes or Playground. Ice Shards can be destroyed by any weapon players are carrying. They have about 1,500 HP and spawn more creatures around them as players reduce their total health. These ice structures spawn at random, but it’s easy to spot them once you find a few Ice Fiends. These creatures spawn facing the opposite side of the Ice Shard, so as soon as you find a monster of the Ice Legion, you just have to look around for a few seconds to spot this huge ice structure. What’s the best way of destroying them? Players can deal damage to Ice Shards the same way they deal damage to anything else in Fortnite: Battle Royale, like shooting them down. There are more efficient ways of doing so, though. Ice Shards behave like structures, so any weapon or explosive that deals additional damage to structures will melt them down very quickly. Explosives like the Dynamite and weapons like the Hand Cannon will be of great help. 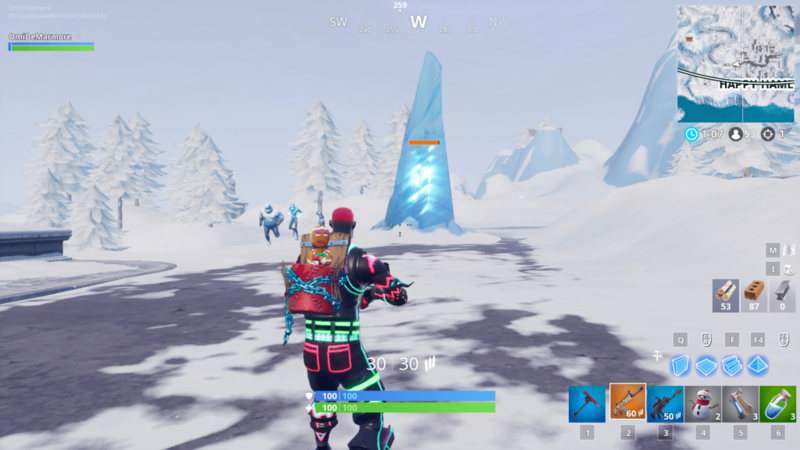 So the next time you drop into a Fortnite: Battle Royale Ice Storm match, make sure to look for the Ice Legion to find an Ice Shard and destroy it. But remember: the challenges asks you to destroy 10 of them in different matches, so find one, destroy it, and either get eliminated or play without worrying about them in your current match.